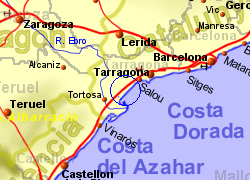 L'Ametlla de Mar, also known as La Cala, is a small town on the southern end of the Costa Dorada,in the province of Tarragona, Catalunya. There is no high rise building or crowds of people but the town boasts a modern marina, fishing harbour and beautiful sandy beaches, some accredited with the blue flag. The town offers plenty of opportunities to wine and dine or take tapas in a local bar. Just south of L'Ametlla is the Ebro Delta Natural Park, an important wetland area with a large variety of waterfowl, including flamingos. 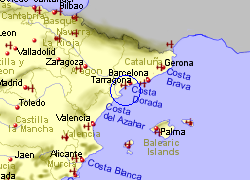 There is a railway station in L'Ametlla de Mar with approximately 10 regional trains per day stopping atother locations on the Costa Dorada (including Port Aventura), plus the city of Tarragona (journey time 1 hr 40 minutes), and Barcelona(journey time 2hrs 10 minutes). 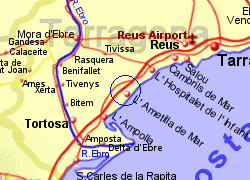 Map of the L\'Ametlla de Mar area. This 3 bedroom house with private pool is located in Les Tres Cales and sleeps 8 people. It has WiFi, a garden and barbeque facilities. The house is walking distance away from golf and beach. This 5 bedroom house with private pool is located in Les Tres Cales and sleeps 11 people. It has WiFi, a garden and barbeque facilities.